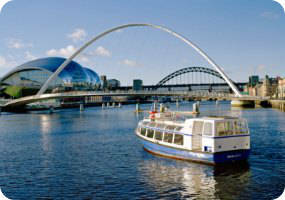 Book now the best shore excursions in Newcastle. High quality and safety at the lowest prices. If your are looking for the best Shore Excursion Newcastle, book now the best guided tours at lowest price with Ancora Tours. Since 2003 we offer you official guides in english, transportation and travel insurance, all included. The highest quality at the lowest rates. With this shore excursion in Newcastle, take a trip back to the past and amaze yourself with the story of the Roman Empire. Today, Newcastle is a modern, cultural centre, possibly one of the trendiest places in the UK. What’s eating: Stotties. A stotty is a large, round bread with a heavy texture. You’ll find them cut in half and filled to make a particular kind of Northern sandwich. Enjoy a visit to one of the UK’s 15 World Heritage Sites on this full-day tour today. Departing from the pier of Newcastle our tour will begin with a drive onboard our bus to the university city of Durham, one of the jewels of Northern England. Upon arrival in Durham enjoy a guided walk through this historic city to bring Durham’s stories to life, ending with a short, uphill climb to the Cathedral and castle. Durham Castle, along with the Cathedral and other buildings around Palace Green, form one of the most striking groups of historic architecture in Europe; while Durham Cathedral is the largest and finest example of Norman architecture in England. More recently the cloisters were used during the filming of the Harry Potter movies. For those who want we will have the possibility to visit the inside of the Chatedreal before getting back to the bus to start the second part of our tour. Returning to Newcastle City centre our next stop is the newly restored Grainger Town area. Characterised by the unique Georgian style architecture of Grey Street (recently commented upon as being the finest street in England), Clayton Street and Grainger Street, is the historic heart of Newcastle upon Tyne. We will spend a little free time here to have lunch and then we will enjoy a brief walking tour around this area before continuing by coach for a panoramic drive of the city (we will pass by St Nicholas’ Anglican Cathedral, and then the beautiful Gateshead Millennium Bridge across the River Tyne). Leaving your coach and walk with your guide across the Millennium Bridge we will have the chance to take some amazing pictures before returnig to the bus that will drive us back to the port.